OWDEB is a non – government development organization. It has been working since 1995 at urban and rural area of Chittagong, Bangladesh. OWDEB emerged with its organizational efforts towards institutionalizing gender and women’s human rights in the socio-cultural, political and economical development process, based on increased concern regarding all kinds of human rights violation procedure in Bangladesh. OWDEB is committed to create a just and equitable society where women and men are treated with same respect, and free from human poverty. We believe that Education is the Key Tool to promote a just society in Bangladesh and the process of Re Gendering must be ensured at the same time. We also believe that if both Women’s Men’s need and trust are not taken into account in our regeneration and development activities, we cannot do more about women’s human rights in our society. In this age of globalization and technology, OWDEB feels responsible to provide extensive information about rights based development issues to everyone in its network. We also believe that everyone is entitled to have the right to access necessary information and local people are actually the experts – no one understands better than them the different challenges they face and needs that they have as women and as men. From this point of view, OWDEB aims to promote sustainable development through a holistic approach. Since its beginning, OWDEB’s development interventions, staff, volunteers and network have grown considerably. OWDEB has opened its door as part of a process towards good governance, organizational transparency and accountability. Now we would like to take the opportunity to express our highest appreciation to our members at the grassroots level, General Committee, Executive Committee, Donor agencies, government organizations, networking partners and other concerned institutions for the cooperation they have given us from the very beginning. We are trying to form a new alliance with same mentalities NGOs, CBOs in Greater Chittagong to make us more capable but we need more support from our friends. We believe that a mutual trust between Donors and OWDEB will make more opportunity for OWDEB to work for a better society and for sustainability of socio-culture based approach of OWDEB. All supports help OWDEB to be more practical, confident to manage critical situation about our works and identity at Community to Local and National level and a far sight what we have to do to build OWDEB as an efficient sustainable pro-people institution. In this way they organized OWDEB as an alternative development platform to work for women empowerment and equal rights of all people through education, cultural practice, advocacy and networking.From very beginning to till now, the Team Leader is Ms. ShyamoliMazumder, an ex- Govt. college teacher, poet and ex-student politician. OWDEB believes that its General and executive Committee, Staffs, all community stakeholders like Community people, Local Government, educational institute, civil society representative, all network etc. 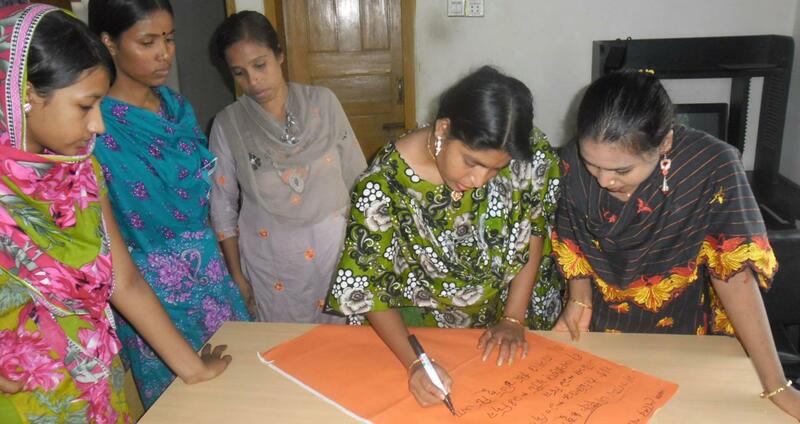 are basic resources to enhance development work for a better gender just society in Bangladesh. Ensure a qualitative achievement of women’s equal right, establishment of her dignity and empowerment through their own participation towards a democratic society. Ensuring participation of both men and women for promoting Democracy, Human Rights and establish a situation of socio-economic and cultural justice for achieving a sustainable democratic society. Joint Stock Company of the Government of the People’s Republic of Bangladesh.